William Tucker, Frenhofer, 1998. Bronze, 210 (h) x 210 x 250 cm / 82 1/2 (h) x 82 1/2 x 98 1/2 inches. Photo: Georg Kipp. The Buchmann Gallery is delighted to announce the second solo show of works by the British/American sculptor William Tucker (b. 1935 in Cairo, lives in Williamsburg, MA). In the 1970s, Tucker belonged to the highly influential circle of English sculptors that included Philip King and Tim Scott, who were presented as the “New Generation” in the eponymous exhibition at London’s Whitechapel Art Gallery in 1965. This group had a decisive impact on the development of abstract sculpture and was largely instrumental in broadening the concept of sculpture. In 1966, William Tucker was invited to take part in the seminal exhibition Primary Structures at the Jewish Museum in New York, a decisive moment in American Minimal Art. During this period he also made a name for himself as a theoretician, critic and curator. In 1972, Tucker published The Language of Sculpture as well as reviews and essays in Studio International, the British counterpart of Artforum. In 1975, he organised The Condition of Sculpture show at the Hayward Gallery in London. Despite their figurative reference, the shape of the sculptures cannot immediately be deciphered and named. They do not depict a simple, clearly readable human shape or gesture. Instead, the sculptures open up a wide field of potential associations, which gives them their insistent and unique physical corporeality. William Tucker’s sculptures have a presence that puts our own body in relation to them and thus heightens our awareness of it. His engagement with the nature, structure and mass of the human body led Tucker to create a series of sculptures, for example Xanthe (1992) and Oedipus III (2014), which are determined more by their abstract shape than their immediately apparent form. The imposing sculpture Frenhofer (1995) is one of the artist’s largest torsos. Other pieces from this body of work are Pamona in the Tate London collection, Demeter in the collection of the Museum of Modern Art New York, and Eve in the Skulpturenpark Waldfrieden Wuppertal. 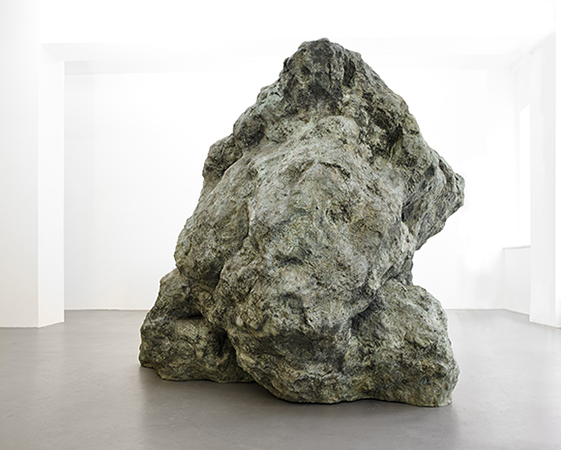 Originally modelled in plaster, Tucker cast his piece Tauromachy (2008) in bronze for the first time for this show. Tauromachy started as a fist, but it suggests a charging bull as in Goya’s Tauromachy etchings. The immediate physical presence of the sculpture also gives it a tangible muscular strength. Oedipus III (2014) sees William Tucker taking a new approach to surfaces: this piece is finished in an unusually intense red colour. Sculptures by William Tucker can be seen in several collections, including the Tate Gallery in London, the Guggenheim Museum, the Museum of Modern Art New York, the Metropolitan Museum New York, the Nasher Sculpture Center Dallas and the Art Gallery of New South Wales in Sydney. The Museo de Bellas Artes in Bilbao will be presenting a major show of William Tucker’s work from 9 June until 14 September.